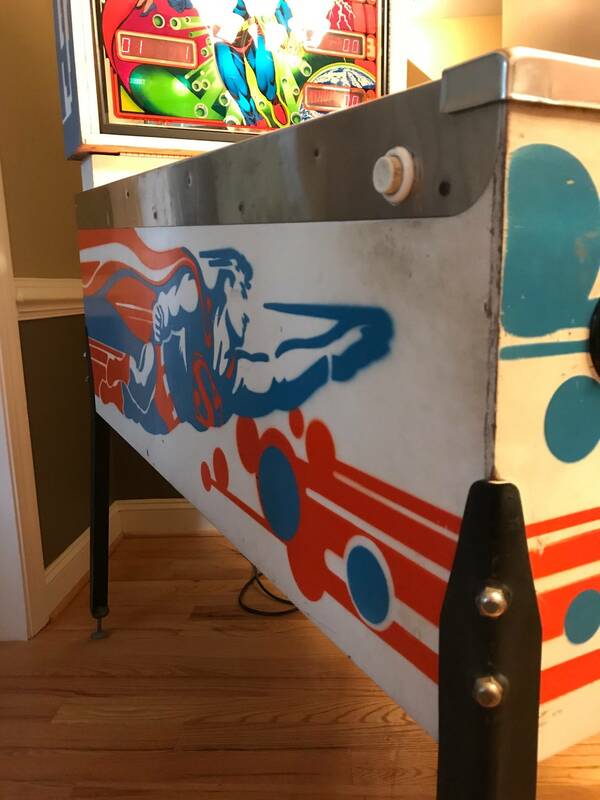 » Forum » All Pinball » New Member, first Pin! » New Member, first Pin! 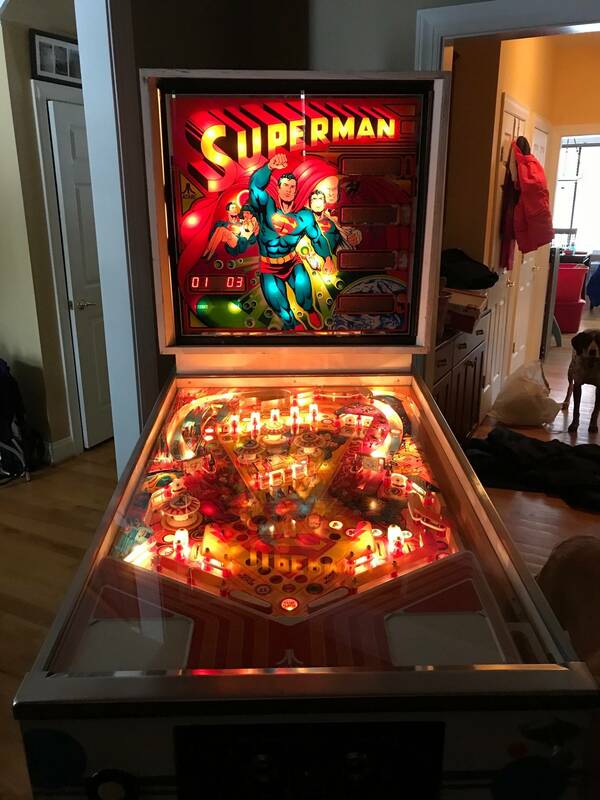 Hello everyone, new guy here from Northern VA and a new pinball owner... 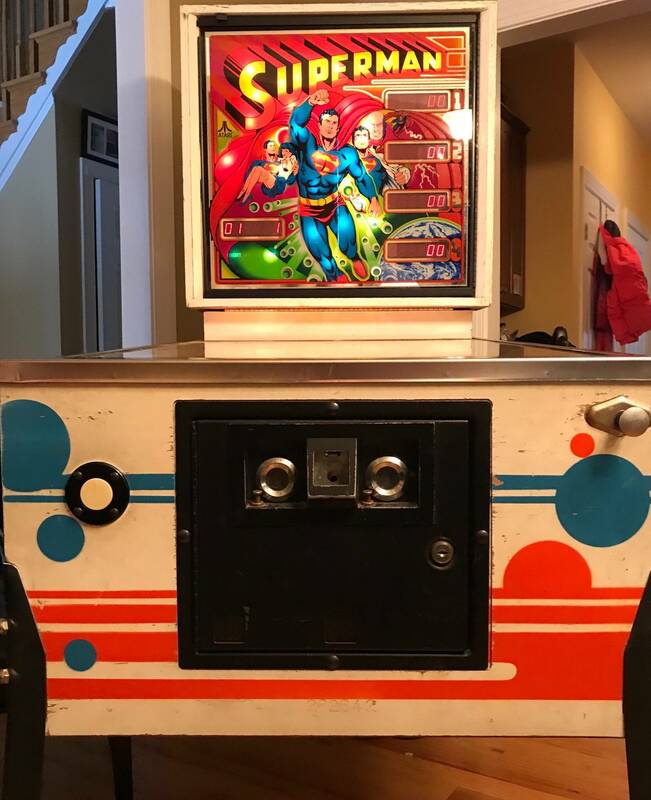 I got my first Pinball Machine this week... 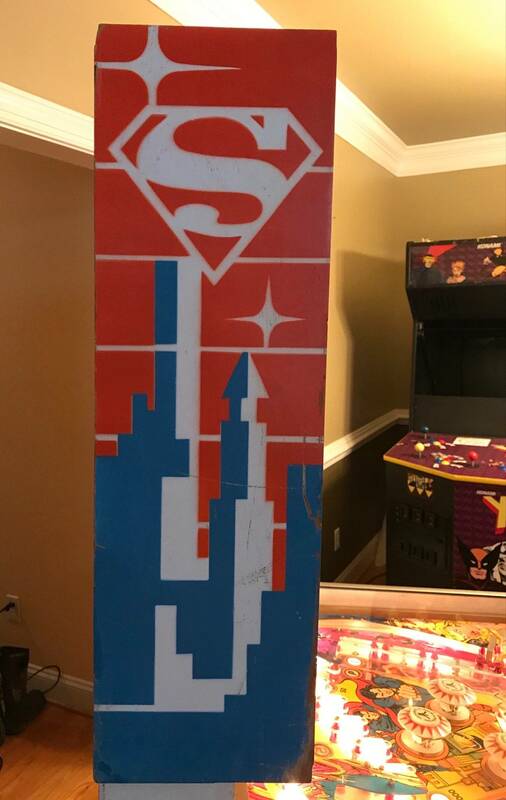 SUPERMAN!!!! I’ve had it a few days now and I absolutely love it. It’s in pretty great shape, especially for its age. After playing for a few days I’ve noticed some issues that I’d like to resolve. I finally figured how to lift the play field today so I took a look around to see if I could troubleshoot some issues I’m having. Pretty minor stuff I think. I defydo not know part names yet so I’ll do my best to describe what I’m trying to talk about. 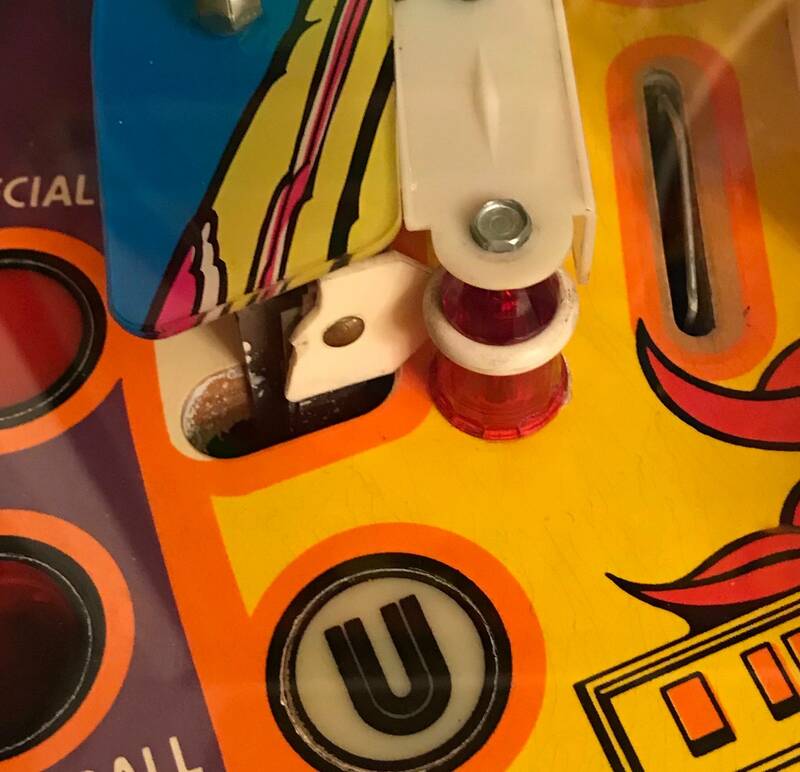 The rollover button needs replaced, It’s difficult to depress and it’s been holding the ball when it isn’t able to go through the turn. When I lifted the field I noticed the switch was bent. Before I try and straighten it I wanted to see if there was a replacement before I make things worse. Aside from that, the plastic is worn and rubbing when you press it, it’s definitely not smooth as the other ones. I removed the part and cleaned it, still not depressing correctly so I want to replace it. The next issue I’m having is with the bumper. It’s broken. 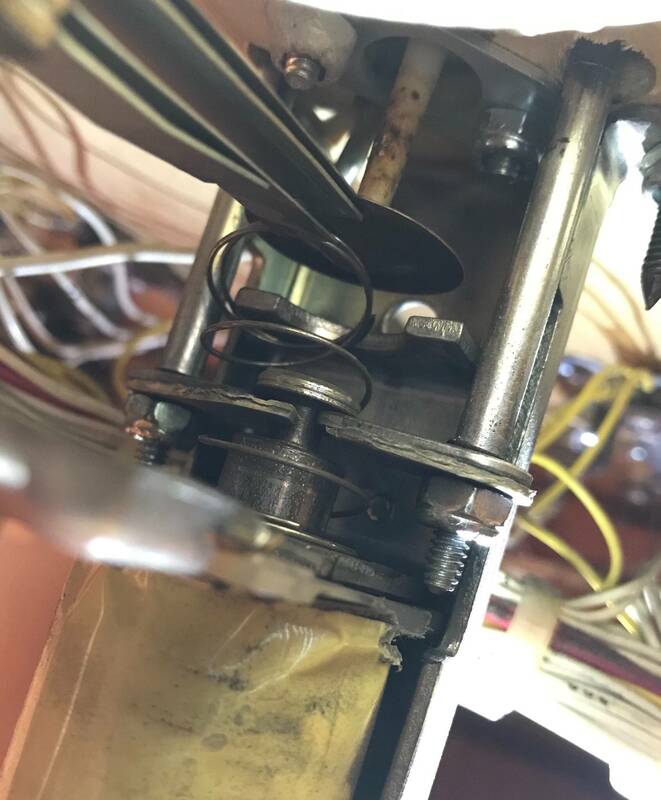 The piece that the spring pushes up is broken in half. The paper clip looking part is broken off. It still works, but I’d like to get a new one. I’m also not sure of the name of this plastic piece but it’s cracked off, it still functions. It’s the one that illuminates the “S”. I’ve got some burnt out bulbs that I want to replace and I’m considering going the LED route. I read that flipping the dip switch would stop the flickering issue that some have had. The posts are older, is this still holding up? Also, what is the difference in bulbs? I see clear, white and soft white? Is it personal preference or will they effect the board? I love playing in the dark so everything pops, What is recommendated? Other than that I guess it’s going pretty well. I put two coats of Mill Wax on the field yesterday, it makes a pretty big difference. It could probably use a couple more. When I flip it on, it makes some sounds and everything lights up, is there supposed to be a test that it runs through each time it starts up? Anyway, looking forward to the replies and love the information so far from this place. Wow that is a beautiful game you got, congrats and welcome to the forum Brandon! 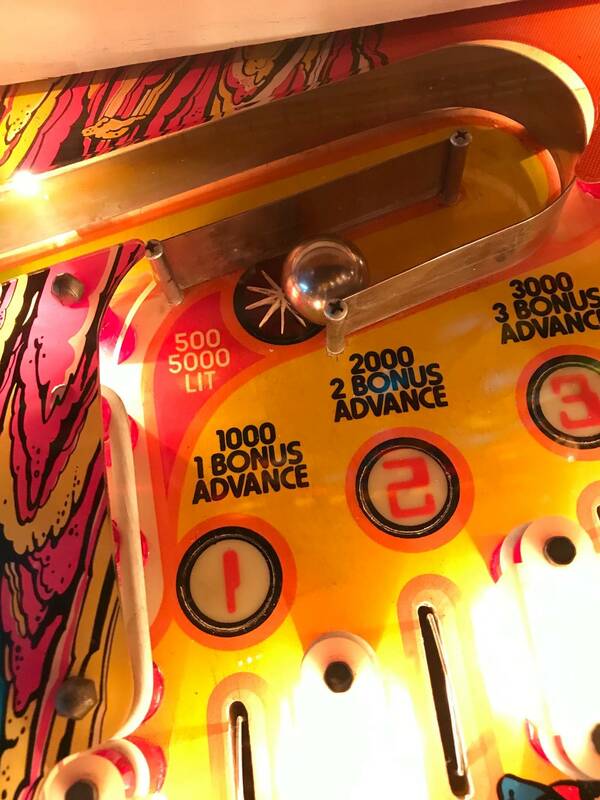 Welcome to Pinside and the wonderful world of pinball. Welcome. 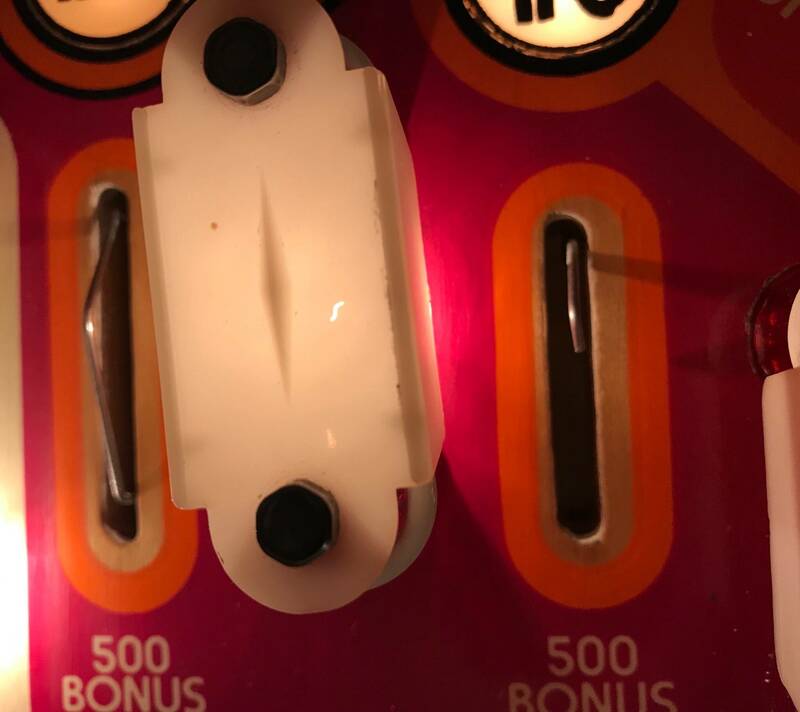 The next thing you know you will have 50 machines. Lol. 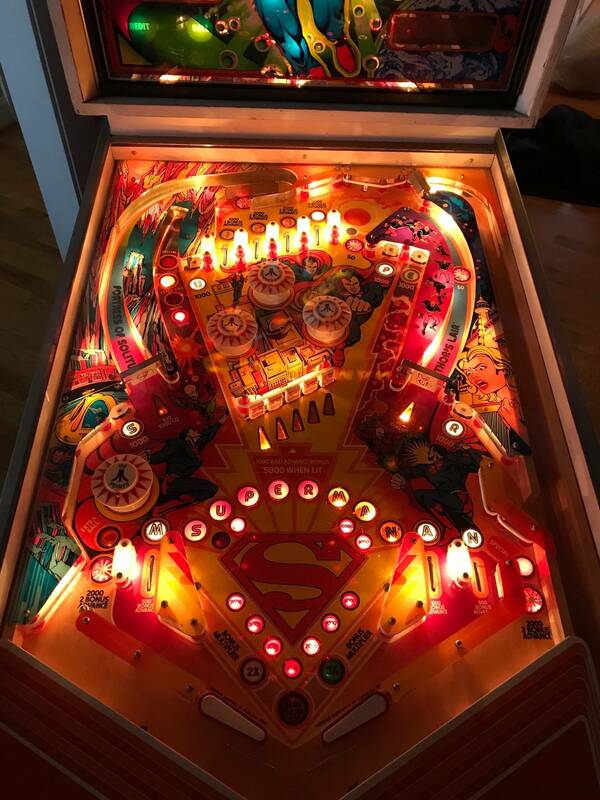 Pinball is addictive!! Nothing like the warm glow of incandescents. I'd leave it that way. Enjoy your game and I'm sure it won't be your last. Good luck with your new addictionand get to know your suppliers. Bunch of good ones but here are 2 you need to know. Classic pin. Enjoy the Pinside experience. Tons of great folks here. Welcome to the club. Your life is going to change because that Superman isn't going to be alone for long ; ). DUDE, you have a 6 player X-men game. N-I-C-E. Loved that game - could get to Nimrod on 1 quarter back in the day with Wolverine. Sell it quick and never come back. OK you have been warned. Probably the best advice I’ll ever get... Hopefully it only hits me half as hard as the arcade addiction has. Welcome to the club. 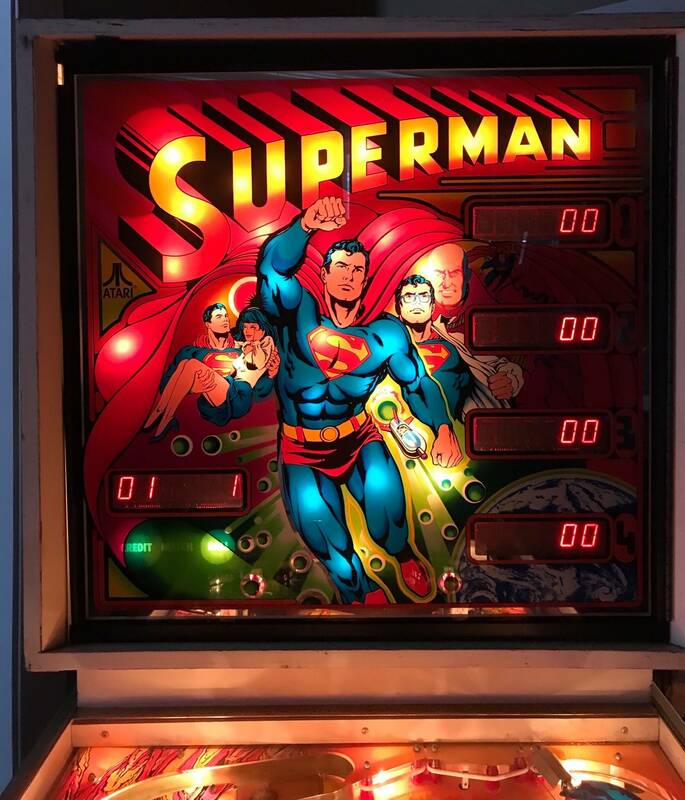 I always thought the backglass on this game was very well done and quite beautiful. Even with the issues you have mentioned, you did well for getting a used first game. Lots of first time buyers end up with games in a lot worse shape. The links vid provided above should help you immensely. Have fun! Congrats on your pin purchase! It’s a fun hobby that can quickly put an enormous dent in your bank account, by the way, you ready for PIN number 2? Most importantly have fun! Great looking pin! Welcome, and enjoy the ride. Good job Brandon !! Young Jedi you have much to learn-there will be ups and downs......all part of the process,take it in and enjoy. First lesson and test ) EM,Solid State,Dot Matrix,LCD/Video ? ?..........these are a generalization of machine and display types/eras-what is your vote on your good looking Superman ? 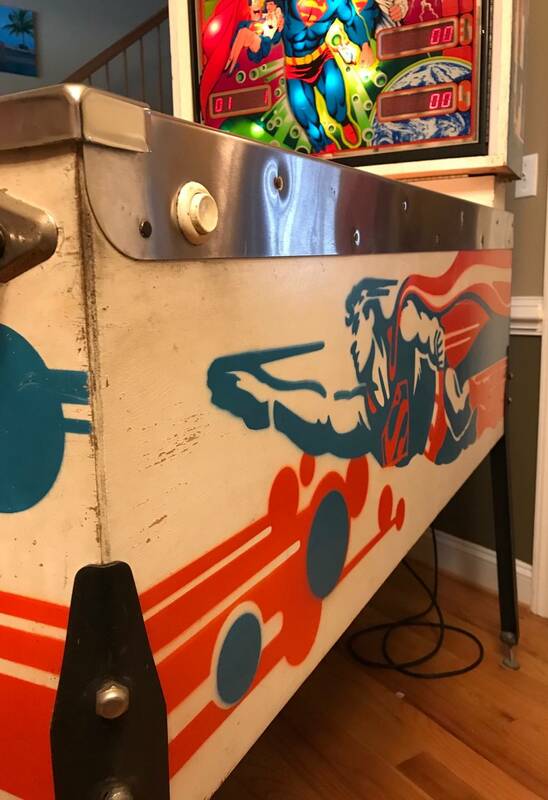 I like your pics,your dog already looks apprehensive and left out-Lol-Like seeing the full size arcade machine there also-I have a nice full size ZAXXON in my house-Pinball machine in living room-ZAXXON in dining room. Congrats and welcome Brandon. Game looks great. Part of the fun is working on them. Enjoy! I replaced the broken yoke fiber and the compression spring for the bumper, works perfect. I ordered a replacement rollover star, I haven’t replaced it as of yet because I adjusted the leaf switch a little and it’s working. If that changes I’ll swap it out. I ordered a couple boxes of bulbs to change out the burnt ones. I’ve found a couple that are still not working after the bulb swap. I’m thinking old solder on the connections, or a wiring issue. I found that one will partially illuminate when I wigggle the wiring. I really hate issues like this. 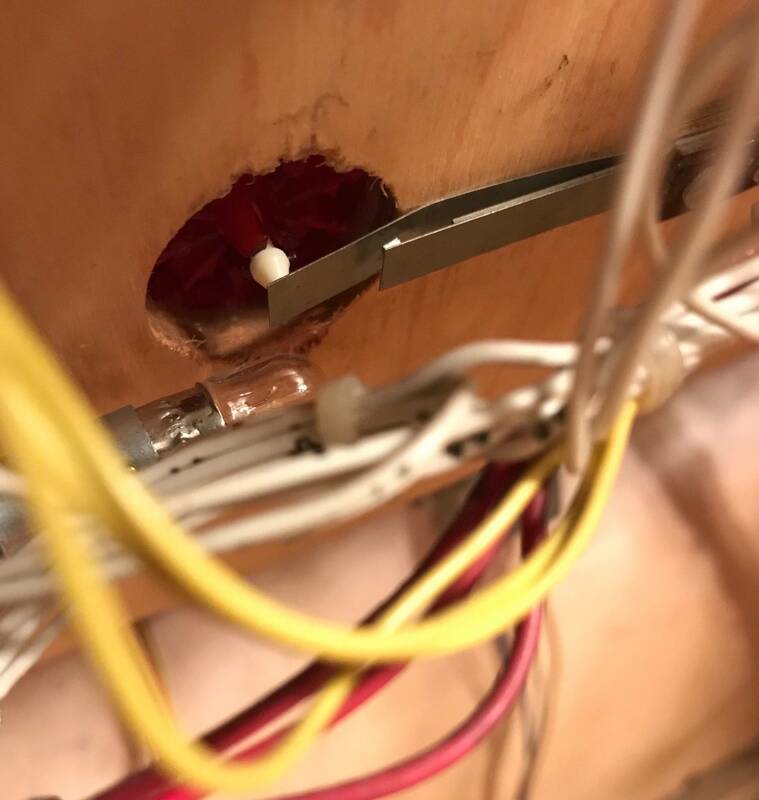 Anyone know what the “Extra Ball” under the dip switch means? I can’t imagine it means 2 balls at once like modern games. I’m assuming that it means an extra play.